Thanks to all who sent me entries in the "Why Sports Matters" contest. I got lots of entries and have had a few unexpected work assignments lately, so my judging has fallen behind. I originally wrote that I would be announcing winners on Wednesday, March 18th. That won't happen, but I will announce the winners in the near future in this same space and also publish them. Thank you for your patience, and in the meantime enjoy the NCAA tournament! (UPDATE: All winners were published in the newspapers of April 12 and April 19th and can also be found at this link. 1) I applaud the Panthers for getting Ted Ginn Jr. back after his disappointing year in Arizona. 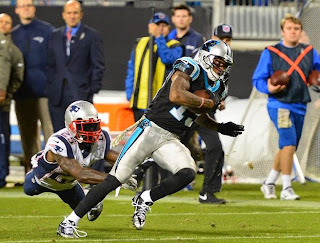 Ginn gives the Panthers another speed threat and had a great knack in 2013 for the big play at the right time (including this TD in 2013 against New England). I thought the Panthers never should have let him go -- they struggled constantly with getting the ball deep in 2014 without him -- but certainly he will be more affordable now. This is a good move, as was the signing of tackle Michael "Blind Side" Oher. Both are affordable veteran players worth the risk. The Panthers are off to a solid start in free agency, but many questions remain. 2) In case you missed this, Davidson had a swimmer named Luke Burton Thursday night who stripped down to a Tuxedo-themed Speedo -- he calls it a "tux-pedo" -- and made a lot of people laugh with his antics while VCU was shooting free throws until he got kicked out of the game (won by Davidson, 82-55 -- the Wildcats are, incredibly enough, Atlantic 10 regular-season champs). My original video of Luke Burton's dance has now climbed to No.5 on the all-time Observer list of most-clicked videos, and Burton's hilarious interview explaining his thinking after he got kicked out is quickly catching up to the original one in hits. You can see them both by clicking here -- the shorter video is at the bottom, and the longer one at the top. 3) I talked to Charlotte resident and ESPN analyst Jay Bilas for a couple of stories last week, including this one on the delights of March Madness. While we were on the phone I asked Bilas if he thought Kentucky would go 40-0, winning both the SEC title and the national championship. He said he thought the Wildcats would, but said while they were unbeaten, they were not unbeatable. Said Bilas of Kentucky: "If they finish the year undefeated and win the national championship, they will be considered one of the all-time great teams and it will be one of all-time great accomplishments.if they finish the year undefeated and win the national championship, they will be considered one of the all-time great teams and it will be one of all-time great accomplishments. "They absolutely can. I think they will. They're unbeaten. I'm not one of those who think they are unbeatable. They can be beaten. I look at them kind of like UNLV in 1991. they are the best team. that doesn't mean they are going to win, but they are the best team. 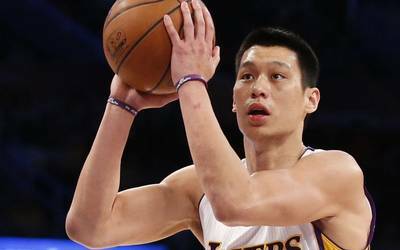 "If this were the NBA and a 7-game playoff series, they would not have to worry. But it's not, and they are subject to being beaten." The Panthers seemed to skip a few people in line today, signing Greg Olsen to a three-year extension that will keep him with the team until 2018. Olsen's contract wasn't up until after this season, so it's a little surprising to me that he was the player the Panther paid first -- only because there are more pressing deadlines. But it must have been the most doable contract on their plate, for Olsen has made no secret of wanting to stay and God knows the Panthers need him. He and Wesley Walls are the two best tight ends Carolina has ever had, and Olsen's rapport with Cam Newton helped him make his first Pro Bowl in 2014. Olsen is also such a high-character guy that it's hard to measure, although I tried in this column from last September. Sometimes, we talk so much about problems with the local teams we forget about the solutions that are already there and need to stay there. Olsen, Thomas Davis, Luke Kuechly, Cam Newton -- all those men need to get paid, too. And, of course, OT, WR and secondary problems must be addressed. So good for Olsen. He absolutely deserved this contract. Man, the guy made his first Pro Bowl (at least one year too late) and then immediately scored two touchdowns in it. But this was just a warmup for what must be to come. What next for Panthers after correctly parting with DeAngelo, Bell? Let us not get overly emotional about the release of Carolina running back DeAngelo Williams. It was absolutely the right thing to do. Williams was no longer an effective NFL running back. He was one for a long time, but by the end of 2014 I thought he was the fourth-best running back on the roster. As I wrote back in January, this should be one of the easiest decisions the Panthers make the entire offseason. While I thought the Panthers should have kept Steve Smith around one more year instead of release him before the 2014 season, if anything I think they kept Williams around one year too long. Certainly, he needed to be released by now. I am sorry he doesn't feel like the Panthers supported him when his mother died, but let's not let that cloud the on-field issues. This column I wrote back in January listed seven things I thought the Panthers ought to do in the offseason. They have now accomplished the first two on my list -- release Williams and don't bring back left tackle Byron Bell, who was simply not good enough last year. 1. Sign a tackle – and then draft another. I think the Panthers will do both of these things. My biggest problem with what Panthers general manager Dave Gettleman didn’t do in the 2014 offseason had to do with him trying to get by cheaply at both tackle spots. That was a mistake. That’s fine, but the dollar store is a great place to upgrade the mostly awful special-teams coverage and return units. 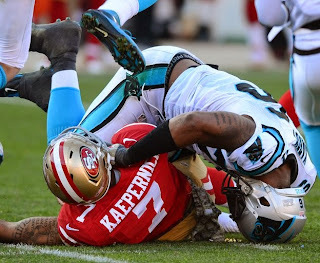 Hello Ted Ginn Jr.?If he comes at a reasonable price, I would like to see it -- as would Panthers fullback Mike Tolbert. All I'm saying is @TedGinnJr_19 back in carolina wld be awesome!!! 3. Stay far away from Greg Hardy. I think the Panthers will ultimately do this even though the charges against Hardy were dismissed. To me, the risk doesn't line up with the reward. 4. Make inroads with Cam. 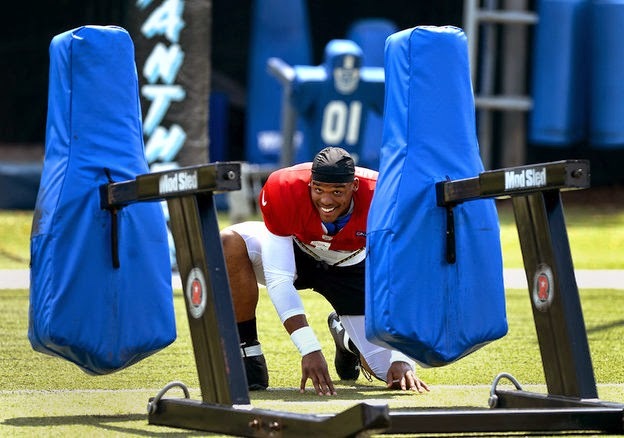 The Panthers are doing this, having reopened negotiations on a contract extension with Cam Newton. 5. Keep more continuity. Late in 2014, the Panthers had 16 new players among the 24 key positions on offense and defense (I am counting the third receiver and the nickel cornerback as starters, too). Only eight players were the same from 2013. That's too much turnover -- way too much -- for a team that won 12 games in 2013. Williams and Bell? They were properly jettisoned. But this team does not need a major overhaul. Last year's overhaul backfired to some extent, and I think Gettleman knows that. This team needs to have far more continuity. As for DeAngelo, he will leave as the team's leading rusher, and he will be missed. DAYTONA BEACH, Fla. -- In the wake of the accident that kept Kyle Busch out of the Daytona 500 Sunday, Charlotte Motor Speedway needs to find a way to quickly place soft walls all around the inside and outside of its 1.5-mile track before its series of big races in May. Like almost all the tracks in the top three NASCAR series, CMS has the SAFER (Steel and Foam Energy Reduction) barriers in a lot of the spots that drivers hit most often -- like the turns -- but not everywhere. Texted Scott Cooper, a spokesman for the Charlotte track, in response to my question about where the SAFER walls were at CMS: "I don't know the percentage [of walls covered with SAFER Barriers at CMS]. We have some on inside walls as well as [the] majority of outside." That's not enough. We saw that Saturday night. Charlotte should learn from Daytona's big mistake, which I wrote about in this column. The Daytona track has been heavily promoting a $400-million renovation, but what it has not done is cover all its walls with technology that is proven to make drivers safer. That is inexcusable and incomprehensible. Daytona Speedway president Joie Chitwood III said Saturday night that his track would change that for future events and cover every inch of its inside and outside walls with SAFER barriers. "The Daytona International Speedway did not live up to its responsibility today," Chitwood said. "We should have had a SAFER barrier there today. We did not. We're going to fix that. We're going to fix that right now." Busch hit an unprotected wall head-first Saturday night in an Xfinity Series race and broke multiple bones due to the impact. He may be out for many weeks. Where Busch hit the wall was not too far from where Kevin Harvick had banged into the wall in the 2014 Daytona 500 -- also hitting an unprotected wall. Harvick's complaints went mostly unnoticed afterward. As Harvick said Sunday of Daytona's decision to put SAFER walls everywhere after Busch's wreck: "I think it's a reaction from the track, unfortunately. I hit the same wall a little further up last year at this particular race and kind of voiced my opinion. Unfortunately, I was just a dot on the chart. There was no reaction. Now there is a reaction from the race track. Hopefully, this is a lesson learned." The barriers are expensive, at a reported cost of $500 per square foot. That means it can cost $2.6 million to install a mile's worth of the SAFER barriers. Tracks throughout NASCAR's top series must install them at least in the corners. But NASCAR does not make tracks line its walls with SAFER barriers on both the inside and outside walls, and only a few of the shorter ones do. Charlotte Motor Speedway has a chance to get in front of this issue. No matter the cost, the Speedway needs to pony up. Put the SAFER walls everywhere, before someone else gets badly hurt. NASCAR suspended Kurt Busch indefinitely Friday night after a Delaware official said in a 25-page written opinion that he believed Busch had "manually strangled" his former girlfriend during a confrontation in his motorhome last September. Busch won't race Sunday in the Daytona 500, and I believe that's a good thing the way things stand now. I am critical of NASCAR pretty frequently -- its championship format still isn't right -- but in the Busch case I thought the organization got it right with this suspension. It waited until there was at least some independent finding of a likely act of domestic violence, and then it acted. You could say that this should have happened sooner, but there was no Ray Rice video in this case. You needed to make sure Patricia Driscoll's story had enough of the ring of truth to act. Now I hope NASCAR keeps some teeth in this. Busch doesn't need to be back on a racetrack anytime soon, and a quick reversal on appeal would only confuse the process. Busch kept saying he was waiting for answers when myself and some other reporters tried to talk to him in Charlotte, in late January. Now he has gotten some, although not the answers he would want. For now, Kurt Busch is and should be out of the sport. Bravo to NASCAR on this one. The Carolina Panthers have raised their ticket prices for the second straight season, The Observer has learned. Ticket prices for the 2015 season will increase again this year throughout the stadium. For about two-thirds of the seats, the increase will be modest -- $2 to $5 per ticket per game. For the remaining one-third, increases will frequently be larger than that. The Panthers' average ticket price will again rank in the lower half of teams in the NFL. Non premium ticket prices for Panthers games will now range from $43 to $160. Ticket prices for new Silver Club seats will start at $250. Renewal packages for PSL owners -- who control about 62,000 of the stadium's 74,000 seats -- will be mailed very shortly. The team is again offering a six-month, interest-free payment plan for ticket renewal. 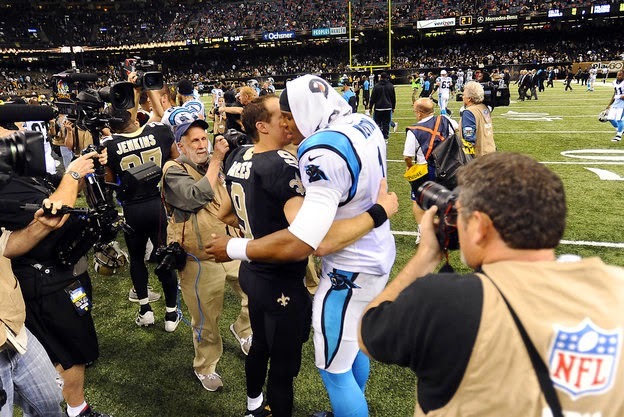 The Panthers have made the playoffs the past two seasons in a row, winning back-to-back NFC South championships. A bit of ticket history: the team raised ticket prices before the 2010 season, then held them firm for the next four years before last year's increase and now this year's increase. The average price of a Panther ticket last season was approximately $72, and that will rise by several dollars for the 2015 season. Panthers president Danny Morrison said in a statement: "As we celebrate 20 years of Panthers football, back-to-back NFC South Division championships and Thomas Davis' NFL Man of the Year award, there is excitement about the foundation that has been established for the future," Panthers president Danny Morrison said in a statement. 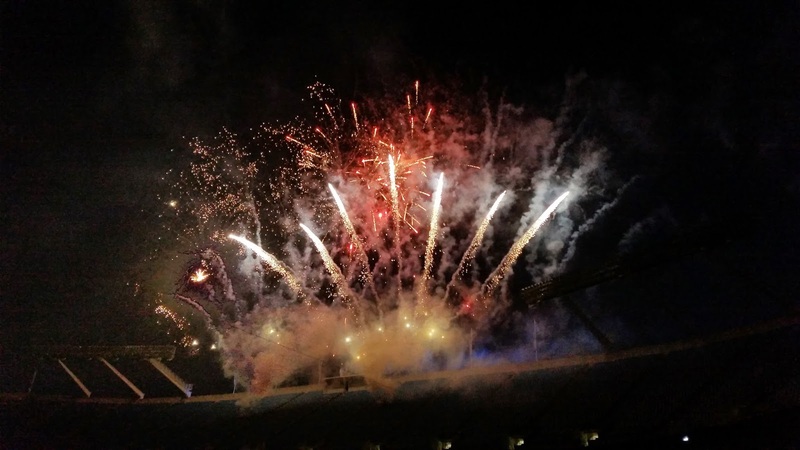 "The fan support has been paramount to this success and has contributed to the unifying and family-friendly atmosphere at Bank of America Stadium..... We will continue to work to provide you the finest gameday experience possible." I was on WFAE, the local public radio station in Charlotte, for an hour today with John Kilgo, David Chadwick, Mick Mixon and Paul Cameron. 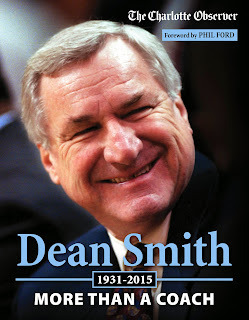 Mike Collins, the host, was asking us for various Dean Smith stories. Everyone in that room had a pretty deep knowledge of the Carolina basketball program, but no one had heard one of the stories Kilgo told before. 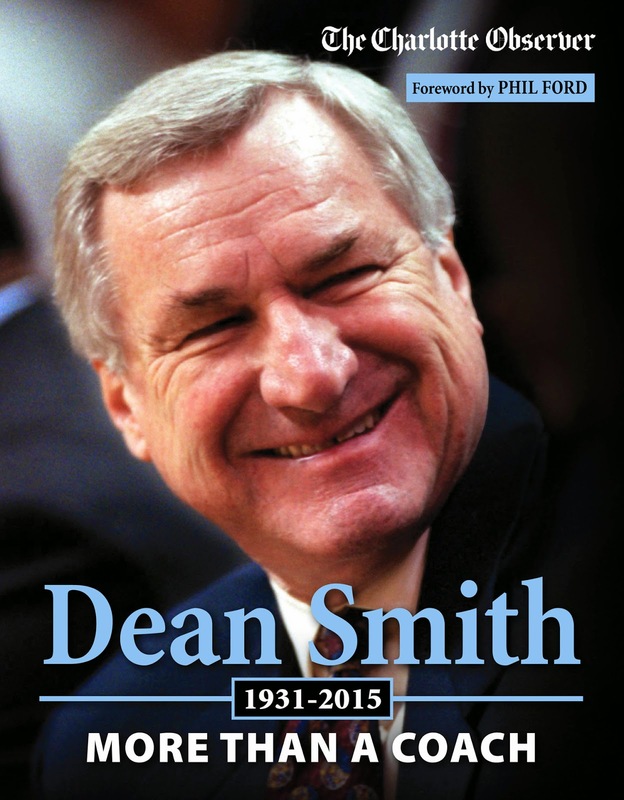 Kilgo, remember, was the co-author of Dean Smith's official memoir , the longtime host of his TV show and was very close to the legendary coach, who died Saturday at the age of 83. We were talking about the cruel irony that Smith -- who had one of the most amazing memories and minds anyone had ever seen -- had slowly deteriorated mentally for many years because of what his family has described as a neurocognitive disorder. Kilgo said that one of the stories Smith didn't let him publish in his book was this (and I'm paraphrasing a little): In Smith's final game as the Tar Heel coach, in the NCAA Final Four in 1997, UNC was losing to Arizona late in the game. In a huddle, Smith told point guard Ed Cota to commit a quick foul against a certain Arizona player. Cota did, quickly, and before long there was another timeout. But then Smith, as he told it later to Kilgo, snapped at Cota in the huddle. "What did you do that for?" the coach asked Cota. "Because you told me to, Coach," came Cota's reply, according to Kilgo. Kilgo said Smith would later tell him this was the first time his vaunted mind had failed him, and that he knew then that ultimately he would never coach another basketball game. Now that the domestic violence case against Greg Hardy has been suddenly dismissed, he definitely has an NFL future somewhere. But I do not believe it should be in Charlotte. I don't think he should ever play for the Carolina Panthers again. Hardy is a free man, yes, and he will be on the open market March 10th when the NFL's free agency period begins. He is 26, in what should be the prime of his career. And he had 15 sacks in 2013 -- the last time he played a full year in the NFL. But to me, Hardy is too much of a risk for a big contract, and the emotional baggage he carries is too considerable for the Panthers to lock into any sort of financial agreement with him again as they think about their offseason plan. Somebody is going to pay him. It shouldn't be the Panthers. Hardy was supposed to go on trial -- again -- on misdemeanor domestic violence charges Monday. Instead, the case fell apart and was dismissed when the prosecution could not secure the cooperation of Nicole Holder, Hardy's former girlfriend and the woman who originally charged him. District attorney Andrew Murray said in court that his office believed Holder and Hardy had reached a financial settlement. In a press release, the DA's office also said: "The victim appears to have intentionally made herself unavailable to the State. The DA's Office has also been made aware that the victim has reached a civil settlement with Mr. Hardy." And, the DA's office said, "Without her testimony, in this particular instance, the State could not proceed." The DA's office had all sorts of trouble finding the elusive Holder, apparently, although it's pretty hard to believe in this day and age she could not be found -- even though she obviously didn't want to be found. This doesn't mean for sure Hardy won't be suspended by the NFL, but I think it's likely he will not be. 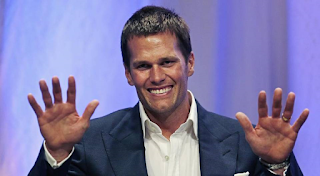 Roger Goodell could suspend him for detrimental conduct, I suppose, but legally his record is now clear. So why not have Hardy apologize to Jerry Richardson and his teammates, fall on whatever type of sword a Kraken carries and then simply come back to Carolina at a reasonable price? Because I don't think he can be trusted, and ultimately I don't think the price will be that reasonable. Look at how last year turned out. The Panthers paid Hardy $13.1 million, effectively hijacking their own salary cap, and he played in one game. Not because of an injury he couldn't help, but because of an off-field issue. If this were going to be settled out of court, I am sure every Panther fan is asking why it wasn't settled before the 2014 season rather than after it concluded. The Panthers' defense did OK without Hardy, finishing No. 10 in total defense last season. As a team, with No.76 on the field, it's undeniable they are better. Carolina could technically use another one-year franchise tag on him, this time at a price of $15.7 million. But it's not always just about talent. Somebody is going to take a risk on Hardy, because NFL teams are desperate for pass rushers in their prime. 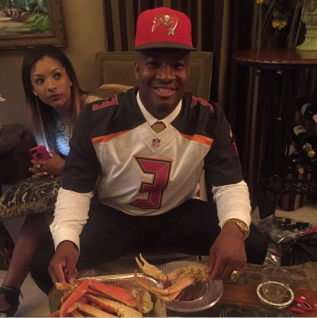 The Panthers, though, already know how that can turn out. After Monday, Hardy is free to go elsewhere. And that is exactly what he should do. As usual, the Carolina Panthers are not in this Super Bowl. But a couple of Panthers -- one former GM, one current linebacker -- had very big and well-deserved days on the day before the big game. Bill Polian, who was the Panthers' general manager from 1995-97 and constructed the team that got to the NFC championship in 1996, made the Pro Football Hall of Fame Saturday. And Thomas Davis won the Walter Payton Man of the Year Award, which honors exemplary community service by a current NFL player. He is the Panthers' first winner of that award and was also a finalist for it a year ago. The Panthers have been fortunate that Davis has played his entire career with Carolina. They would have been well-served had Polian stuck around longer than three years. Polian won everywhere he went and had even greater success before Carolina (in Buffalo, where he put together the nucleus of a Bills team that went to four Super Bowls but never won one) and afterward in Indianapolis (where his drafting of Peyton Manning with the No.1 overall pick in 1998 eventually helped the Colts win the Super Bowl). He is the most accomplished GM the Panthers have ever employed, although it wasn't all roses. Polian's last Panther squad, in 1997, got old in a hurry on defense. There was one other former Panther who didn't have a good Saturday. Kevin Greene, who I believe one day will make the Hall of Fame, missed by an eyelash yet again. Greene made it to the final cut, but was not selected. Greene only played three of his 15 years in Carolina, but if and when he does get in he will be the first hall of famer who had more than one season in a Panther uniform. He averaged nearly 14 sacks per game in those three seasons. (The late Reggie White, who got in because of his great work in Green Bay and Philadelphia, played one forgettable season in Carolina at the end of his career). Polian still lives in Cornelius. He and his wife kept an offseason home in the Lake Norman area for years even when he worked in Indianapolis, and now that he is working primarily for ESPN they still make their home only about 20 minutes from the stadium where Davis still does his work. I have always thought Davis should have made at least one Pro Bowl. Last year and this year he has done the best work of his career -- this after three serious knee operations on the same knee -- and that should be more nationally recognized. But winning the Walter Payton award is a major honor and one that should help Davis do even more good work in this community, as well as in his Georgia hometown. For that, we can all be grateful. 1) Turnovers. Seattle had zero. Carolina had three -- all charged to quarterback Cam Newton. Newton's turnovers were the worst part of this, certainly, but the Panthers' defense really needed to come up with at least one big play on this night, and it did not. 2) The young secondary got exposed. Tre Boston allowed a 16-yard TD pass. Bene Benwikere allowed a 63-yarder. On both plays, the rookies simply lost sight of the ball and were taken advantage of by Seattle's Russell Wilson, who was the best player in this game. 3) Luke Willson. Seattle's young tight end is overshadowed by the quarterback who shares his surname (except for that extra 'L'), but the Panthers couldn't cover him all day. He was targeted four times, caught all four and gained 68 yards with one TD. 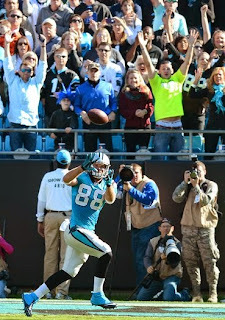 His numbers were better than Carolina Pro Bowl tight end Greg Olsen (4-58, no TDs). 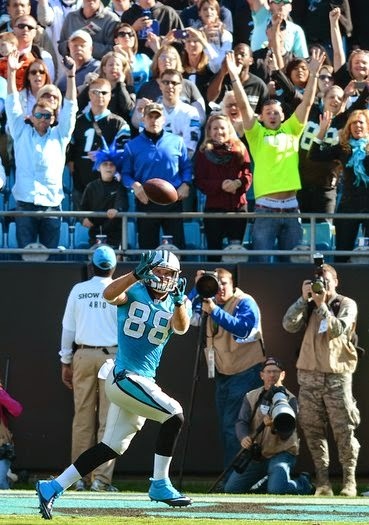 Willson must love the Panthers -- he scored the game's only TD in October in the final minute to beat Carolina, 13-9. 4) Kam Chancellor. Seattle's star safety was all over the field. He nearly blocked a Carolina kick -- twice! -- by jumping entirely over the Panthers' line. And although that ploy didn't work, he later baited Newton and got a 90-yard pick six for his trouble that clinched the game. 5) Talent differential. Look, Carolina doesn't have as many good players as Seattle does. That's just a fact. When you are asking Philly Brown to make a play on a deep ball against Richard Sherman, or you are asking Colin Jones to figure out how to not allow Wilson to complete a pass -- that's just a mismatch. There were too many of them on the field, and eventually Seattle was bound to exploit a number of them. 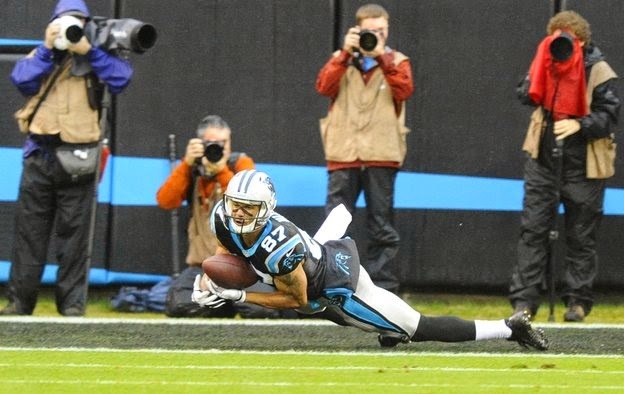 I am writing a story for Friday's newspaper and online about the 10 defining plays of the Panthers' surprising season. To do so, I enlisted the help from a panel of 10 current Panthers as well as coach Ron Rivera. The following play, described by enthusiastic Panther cornerback Josh Norman, ultimately didn't make the final cut. But it was interesting. The way Norman sees it, the Panthers knocking Cleveland rookie quarterback Johnny Manziel out of the game on Dec.21st nearly ruined Carolina's season. Manziel, in other words, nearly wrecked the Panthers' year by getting hurt. 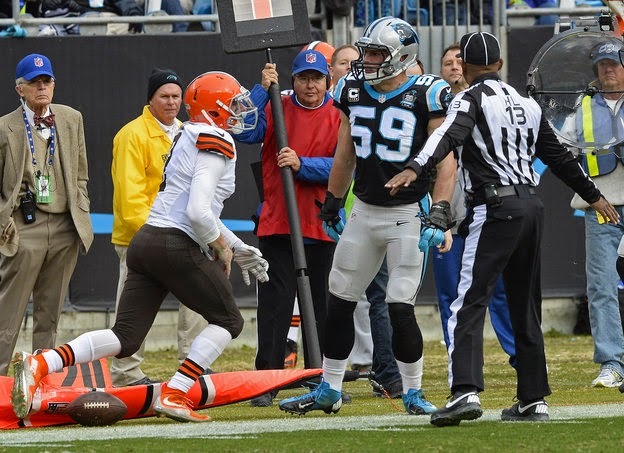 Needing to beat Cleveland at home to make the playoffs, the Panthers' Colin Jones and Luke Kuechly combined on a hit of Manziel early in the second quarter on a designed run by Manziel. Manziel tried to get up, couldn't (you can see him reaching for his leg in this picture from The Observer's Jeff Siner, which shows the aftermath of the tackle) and left the game with a hamstring injury. Brian Hoyer -- a player Norman considers a far better quarterback -- replaced Manziel and nearly led the Browns to a win. "We were [unhappy] that he didn't stay in," Norman said of Manziel, who ended up 3-for-8 for 32 yards. "It was like, 'Oh, ----, now we've got a better quarterback.'" Hoyer threw an 81-yard TD pass in the fourth quarter that put Cleveland ahead, 13-10. If the Browns had held on, Carolina would have finished 6-9-1 and New Orleans would have won the NFC South. Instead, Carolina got a late touchdown on Cam Newton's nine-yard pass to Jonathan Stewart (which did make the "top 10" cut). But Norman said the outcome never would have been in doubt and that the Panthers would have won much more easily had Manziel not been knocked out of the game. "If he [Manziel] had stayed in, it would been a nightmare," Norman said. "His numbers would have been horrible. The best thing that happened to him was getting hurt. That was going to get ugly real quick." 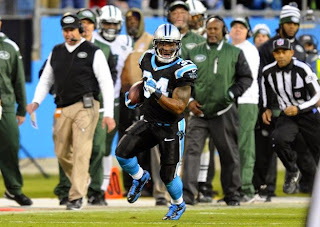 1) Jonathan Stewart has to rush for more than 100 yards. Seattle's secondary is the best in the NFL, so it's no wonder Cam Newton struggles against the Seahawks. Remember what the Seahawks did to Peyton Manning in the last Super Bowl? But Stewart has been on such a roll that a great game from him could be a huge difference and a crowd-quieter (he had 79 yards in Carolina's October loss). 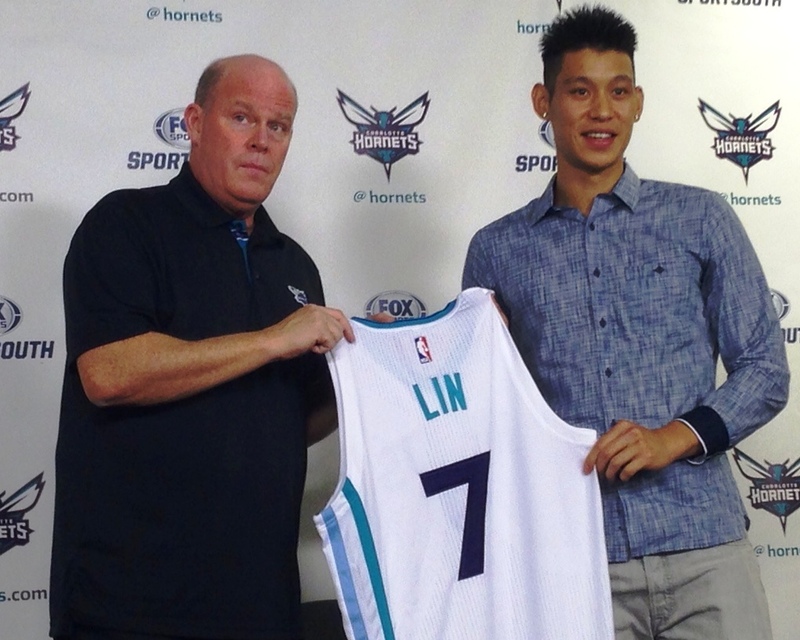 2) Carolina can have no more than one total turnover. Preferably, this number would be zero. I think the Panthers could survive one turnover in some circumstances. More than one? No chance. 3) Never fall behind by more than 10 points. This Carolina offense, against that Seattle defense, in that environment? It's not going to work to have to play catch-up. If the Seahawks get ahead by more than 10, it's over. 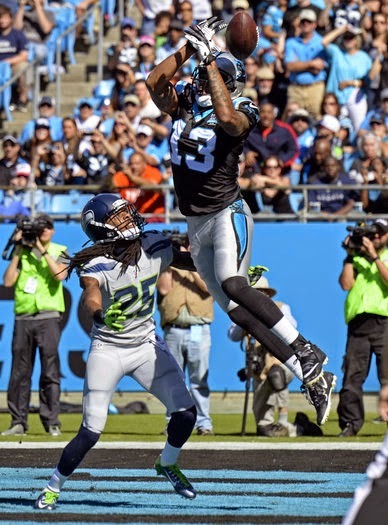 If the Panthers stay close and don't make big mistakes, though -- in other words, Kelvin Benjamin can't drop a ball in the end zone like he did in October (see above picture) -- they will have a chance in the fourth quarter. 4) Two turnovers from Russell Wilson. You're not going to stop Wilson all the time -- he's just too good. But occasionally he will throw a bad pass, and because he runs so often (and takes some sacks because he is so confident in his running ability) the ball is sometimes available. I think Wilson would need to turn it over twice for Carolina to win. 5) Two big plays by relative unknowns. Remember Fozzy Whittaker's 39-yard touchdown off a screen pass last week vs. Arizona? Or Kevin Reddick's fumble recovery inside Arizona's 5? I'm talking about something like that -- twice. 6) Luke Kuechly and Thomas Davis have to be "hellacious." That was Arizona receiver Larry Fitzgerald's word for Nos.58 and 59 last week after both Panther linebackers played a fantastic game in Carolina's 27-16 win. They will have to be just as good vs. Seattle -- and maybe better. When you are sitting in the rain and the football stadium where you are sitting doesn't allow umbrellas, it's all a matter of perspective. Carolina Panther fans will almost certainly have that experience Saturday, as rain looms over the forecast. It will be cold, it will be wet and it could be very nasty -- if the Panthers are losing. If the Panthers are winning, on the other hand, this will turn into one of those "I'll Never Forget When...." sort of games. Panther fans who sat through the monsoon in December 2013 in Charlotte when the Panthers faced New Orleans were rewarded with a last-second touchdown catch to win the game by Domenik Hixon (shown above). Making it through that game is now worn as a badge of honor among Carolina supporters. This one could be the same way. Panther fans haven't seen their team win a playoff game in nine years. A little rain would only get them singin' in the rain if that happens. But if Arizona wins and it pours, everyone in blue will just seem as miserable as a soaked cat. -- Although Arizona is on the road for this game in Charlotte, both teams' dream is to return to Phoenix 29 days from the kickoff. The Cardinals' home stadium hosts the Super Bowl on Feb.1. -- It wasn't that long ago that the Cardinals were vilified as one of the worst franchises in sports, but that has changed. The Cardinals have played seven playoff games in the past seven seasons. In the previous 74 years combined, they also played in seven total playoff games. -- A wet field would slightly work to the Panthers' advantage, since they are a far better running team than Arizona. Then again the Cardinals have the best deep threat on the field -- Michael Floyd -- and one slip by the Carolina secondary could change things in a hurry. -- Why are the Panthers wearing white jerseys in January for this game when they usually wear black once the weather gets cold? I suspect it has a lot to do with the fact Carolina has been more successful in white uniforms than in any other color during the playoffs. 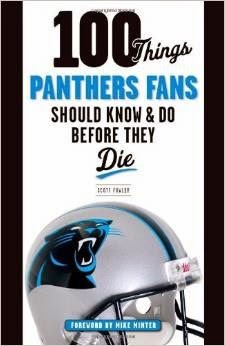 -- Prediction time: I am 10-5-1 picking the Panthers' outcomes this season. I don't think either team will score much more than 20 points in this one. Arizona has held 13 of 16 opponents to 20 or under this season (best in the league in that category). Carolina has allowed only 43 total points in the last four games, which is two points less than it allowed in November to a Philadelphia team that ultimately didn't even make the playoffs. The difference? It will come down to the quarterbacks and their offensive lines. Carolina's Cam Newton should and absolutely has to outplay Ryan Lindley in this one. 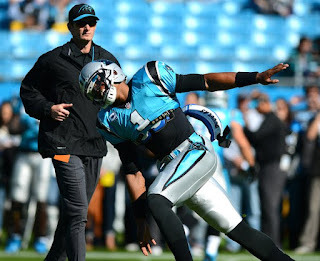 Newton can't pull a "Jake Delhomme six years ago" Saturday. The Panthers have been handed a tremendous break due to the fact that Arizona must start its third-string quarterback. I think they will take advantage of it. My prediction: Carolina 17, Arizona 12.